Hand rolled sticks, resins and charcoal, and cones. Also offers burners and storage boxes. Wildberry brand incense, incense burners, ashcatchers, original Nag Champa, delicious fragrances, celtic jewelry and tapestries, Primo cone incense, custom woodburning portraits, buttons, key chains & magnets. Incense from India and beyond. Auroshikha, Nag Champa and Surya. Offering aromatherapy oils, fragrance oils, incense, Mermade Magical Arts incense, Nag Champa, Celtic Moon, incense burners, oil burners, smoking herbs and resins, including dragons blood. Mainly voodoo but an impressive selection of pagan incenses. This targeted incense for all is so diverse that they even offer custom incense blends. Proprietors of fine aromatic incense resins, herbs and woods, natural incense mixtures, Japanese incense, exotic oils, organic meditation cushions and yoga mats. Wild-crafted botanical smudge wands and incense. Providing fresh hand dipped incense sticks and cones. Incense of all fragrances, and incense burners. Wholesale and retail. Dr Dolkars medicinal incense products. Tibetan herbal incense. Jewelry, rosaries, and sculptures made of natural incense. Incense for meditation, health and all spiritual practices. Imported incense sticks and cones. Also offers holders and burners. Our incense sticks and cones are designed by using the scents of nature harmonious with todays lifestyles. Hand-made, fresh incense with accessories, testimonials, specials, and gift packs. Handcarved soapstone incense and oil warmers, candles holders, and tart burners. Incense, essential oils, soaps and body care products, and herbal creams. Also offers tips for inspirational living. Incense prepared from natures finest essential oils, exotic flowers, woods, tree powders, resins, herbs and spices. Tibetan incense made from herbs, flowers and minerals. For creating a peaceful and soothing environment for meditation. Hand dipped incense, soaps, essential and fragrance oils, and lotions. Glowing and smoking ceramic incense burners. Other types of incense burners, and novelty gifts also available. Incense sticks and cones using all natural resin. Selection of Japanese origami folding paper, incense products and collection of natural soaps. With useful information on aromatherapy, incense and soaps. Based in London, England. Tibetan Incense made from herbs, flowers and minerals. Incense and aromatherapy burners and warmers. Offering a variety of fragrances and burners. Variety of incense and fragrance products. If the business hours of Incense Central in may vary on holidays like Valentine’s Day, Washington’s Birthday, St. Patrick’s Day, Easter, Easter eve and Mother’s day. We display standard opening hours and price ranges in our profile site. We recommend to check out incensecentral.com/ for further information. 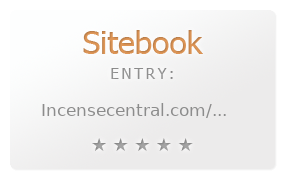 You can also search for Alternatives for incensecentral.com/ on our Review Site Sitebook.org All trademarks are the property of their respective owners. If we should delete this entry, please send us a short E-Mail.